Designing cover art for any online product can be a real hassle. Hiring designers, waiting on rounds of revisions, and optimizing image resolutions and file sizes all takes time and money. And what happens when you need to make minor modifications to images? Turns out it’s not so minor after all. You’ll either have to pay designers again just to make the small tweaks for you or load up Photoshop to do them all yourself. Well, this post is going to save you time and money by showing you exactly how to build an attractive eBook cover in just a few minutes using nothing but Thrive Architect. Watch Shane’s video tutorial above and read our step-by-step explanations illustrated below to learn how you can do the same in minutes on your own website. Final eBook cover design you'll learn how to build in this tutorial. The file size is much smaller making your load times near instantaneous compared to images. Whenever edits or modifications are needed, you can change the text, colors and features of the design object in moments compared to the hassle required in modifying images with other tools like Photoshop. You get to save such designs as either Templates or Symbols in Thrive Architect making them easy to load up and reuse whenever needed across your website. All that being said, here’s Shane’s recipe for creating the eBook cover showcased in this post. Let’s Build an eBook Cover Design Using Thrive Architect! First, you need to set the background color gradient. The color codes for this particular design are lavender (#7a8de5) and pink (#f65fd0). 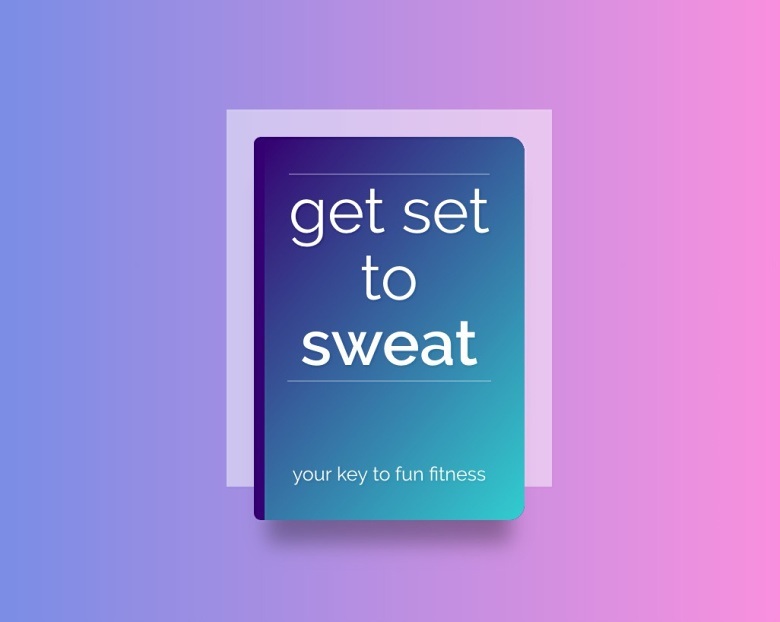 To create this effect, select the linear color gradient option and set the Angle to 90 degrees in the Background Style tab of whatever parent element will be holding your eBook cover design (like a Background, Column, or Content Box element). 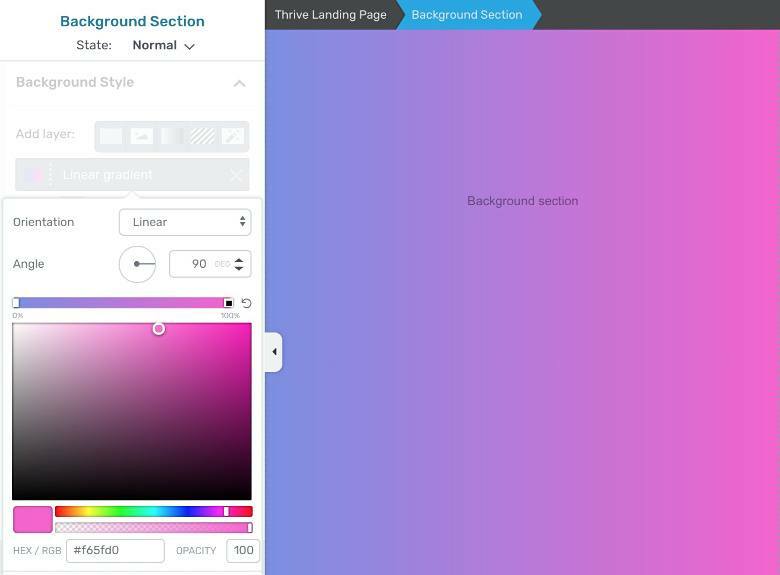 You can also add a background image that will be lightly visible underneath your color gradient from the Background Style tab. To do this, click the image button, select an image from your WordPress media library, and then set the Opacity of your color gradient to 70%. Next, drop a Content Box element onto your page over the background you’ve just prepared. 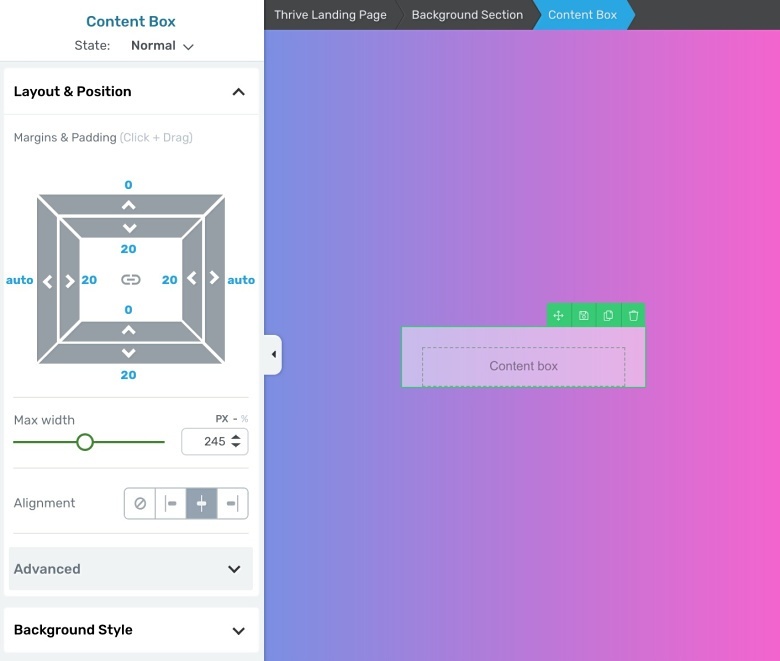 Center-align this content box and set its inner Padding to 20 pixels on all sides except for the bottom. Also, set the Bottom Margin to 20 pixels. Next, drag & drop a new Content Box element within the opaque white content box. 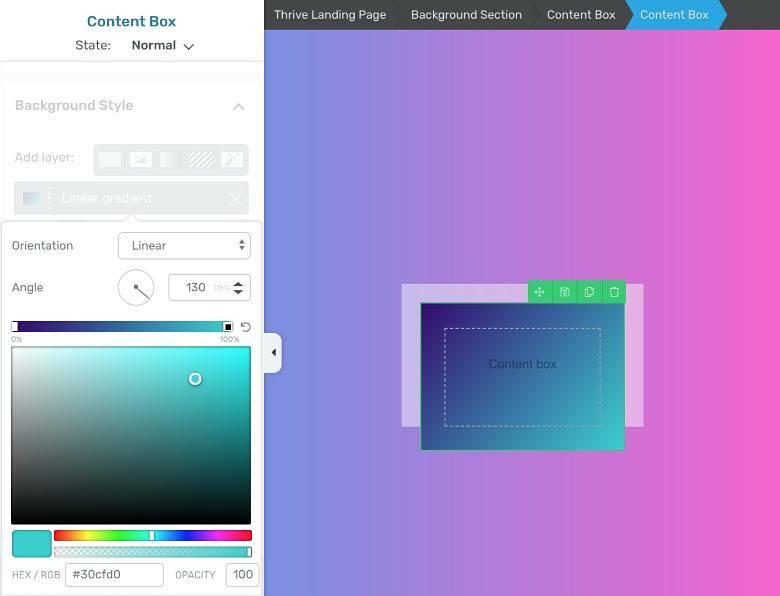 Set the gradient colors for the new content box to dark blue (#350071) and teal (#30cfd0). Place the two colors on a linear gradient with a 130 degree Angle. 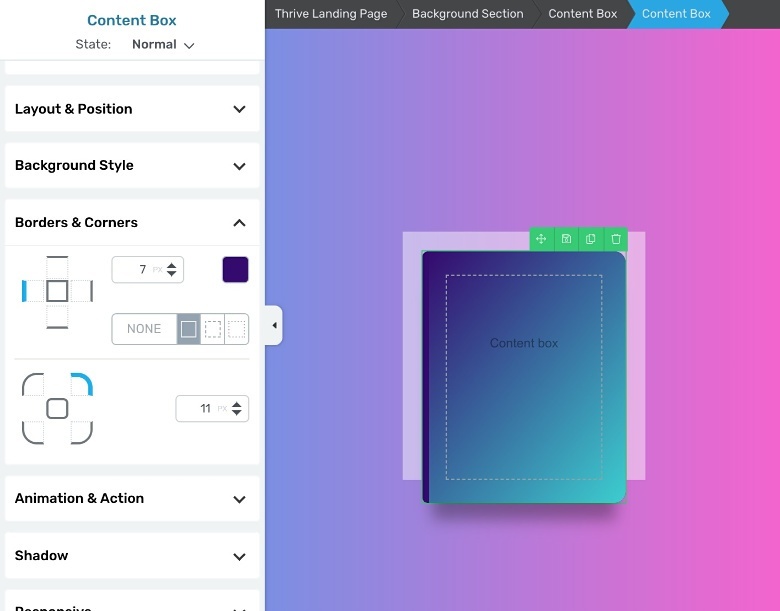 Under the Layout & Position tab, set the blue content box padding to 24 pixels on every side with a negative 24 pixel margin on the bottom to make it extend out from the white content box. Click on the blue content box Borders & Corners tab in the editor sidebar and set the two Left Corners to 5 pixels of rounding and the two Right Corners to 11 pixels of rounding. This will give the inner content box a “notebook” style look. Following that, set the Left Border to 7 pixels with a dark blue (#350071) color. Finally, hit the Shadow sidebar tab to place a Drop Shadow at the bottom of the blue “notebook” content box. Set the drop shadow settings to: Black (#000000) at 30% Opacity, 270 degree Angle, 27 pixel Distance, 24 pixel Blur, and negative 10 pixel Spread. With the inner blue content box selected, click its Typography tab in the sidebar and set the Font Face to Raleway (a Google font you can set at a Regular Font Weight of 300 and 600 Bold). These font settings will be applied to the Plain Text elements you will soon insert in the content box as decorative text. Now, insert a Divider element into your blue content box. Set its Color to white (#ffffff), Width to 1 pixel, and then dial its Opacity down to 30% to give it a thin appearance. Next, clone the Divider element so you have two in your blue content box. After that, insert a Plain Text element in between your two dividers to start adding decorative text. Write “your eBook title” with hard returns where needed. Bold one of your words in the title for emphasis and set the Font Size to 46 pixels and the Line Height to 1.05. Insert another Plain Text element in your blue content box underneath the second divider element. Type “your subheadline” and set the Font Size to 14 pixels. Finally, add margins to the top and bottom of your divider elements to space the text out in an appealing way. Also, with your blue content box selected, adjust its Content Minimum Height feature (found in the Content Box Options tab of the editor sidebar) to achieve the correct “notebook” height and width proportions. Something like 225 pixels should work well for this. If you’re really short on time and need this particular ebook design right now, it’s available to you in our Fit Brand Homepage Template in Thrive Architect. Simply load the FitBrand Homepage template on a new WordPress page using Thrive Architect, save the design element as a template, and then load it on any page, post, or opt-in form you need using Thrive Architect’s Templates & Symbols element. 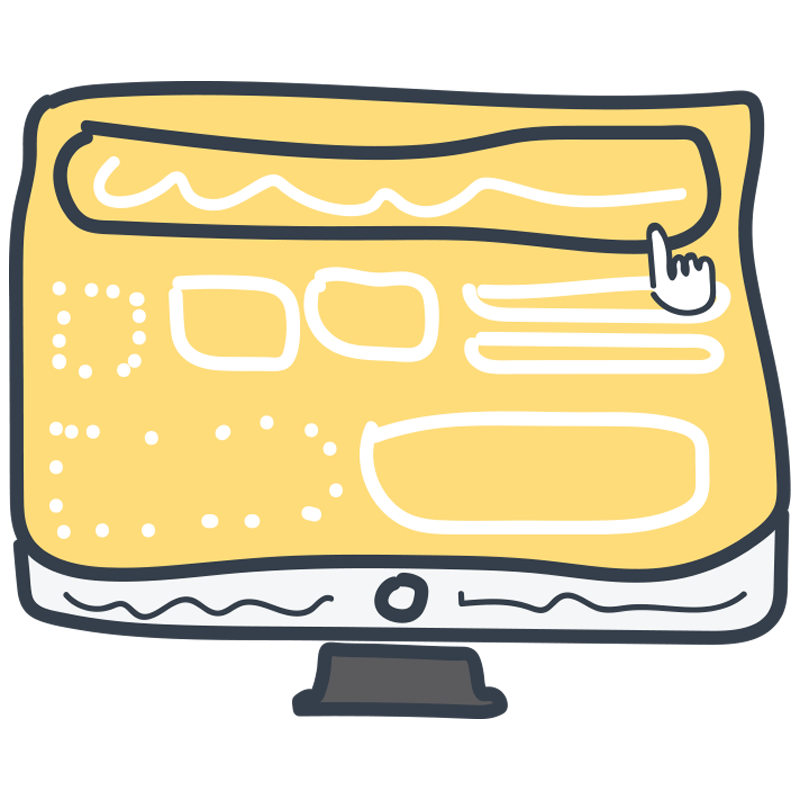 Once loaded, you can quickly modify the text, colors and features to suit your website’s needs and branding. If you followed Shane’s eBook Cover tutorial video or the step-by-step instructions in this post, it becomes clear how simple it is to build, modify and reuse cover designs for your online products. The question is now, why aren’t you doing it? Take a few minutes right now to go build and publish your own cover design to see for yourself. If you have any questions or comments about this design or have requests for other design object tutorials you’d like to see, share them in the comments section below! Nice! Then, if you want to use that graphic on a pdf download, is there a simple way to do that? I completely agree Paul. Very disappointing result. This is made for non-designer entrepreneurs. It’s something any Thrive Architect user can do, for about $200 less than CoverActionPro. Also, I’m seeing a trend away from the realistic 3D look that programs like CAP create. The expectation is no longer for something to be equivalent to a “real” hard copy. A more stylized representation of a product is becoming the norm. I am seeing this trend away from the 3D as well. I think especially since mobile users are increasing, we will see more simplistic features. This is an awesome, timesaving workflow. Great work, Thanks. Thank you, Sofia! Glad to know it came at a good time for you. Thanks. I really appreciate this concept, it will be a real time saver. As a suggestion for the build it series, I would like to see ideas on a way to build a table, in Thrive Architect, that has a list on the left of benefits/features and 3 +/- option columns. The table should show what benefits are included with each option using images like check marks for included benefits and X for benefits not included. Thanks. In the meantime, I suggest having a look at the image options :) When you insert an image with Thrive Architect you can easily put a computer screen or tablet around the image. That might just do the trick. Hire a designer! That cover is pretty boring. Rapid implementation, John. That’s what we’re doing here. The goal isn’t to have the best possible ebook cover, it’s to have something immediately, at a low cost. We can always spend money on professional design work once the business is making enough money to do so. Thanks for always bring amazing and useful tutorials. Love Thrive Themes. Thanks for the tutorial and tips!! I’m also very interested in the possibility to download it for use in the actual e-book (PDF). Love this video I’ve been looking for this for years. The only issue I have is finding these when I need them. At the moment I keep the email so I can click right through to it but otherwise, it takes me ages to find what I am looking for. Thank you for your input, Jennifer. That’s an interesting problem. I’m not sure how we can solve it, but we’ll think about it. It’s only a pain Matt if you’re not an artist and/or a cheapskate for not hiring a designer. The method you shown is not the professional way. The real ART of making book covers or similar is in the painstaking process of conceptualization, research, sketching, photography, typography and photoshop work. That painstaking process is welcomed by real designers and artist Matt. There is no substitute to real hard work and real quality, and not your sub-par quality and shortcut method. Please stop creating programs Matt that seems to take away the jobs of designers and artist for your personal gain. Do not also destroy the traditional way of doing artworks by recommending your non-professional shortcut and non high-standard output. I am not even sure if you guys are professional artists to come up with your own “design” program in the first place. Hiring a professional designer or agency is always the way to go. Please don’t destroy our industry. What you’re saying makes sense from the perspective of a professional designer who wants to preserve their income. However, from the perspective of an entrepreneur starting a small business, saying “hire professionals” isn’t a good solution. Of course, you can make the case that every part of your brand and website should be hand-crafted by professionals. But all that does is raise the barrier of entry. It means that you need a budget of thousands, just to get the basics (logo, website, ebook cover,…) set up. The net result of that would be less entrepreneurship because a lot of people can’t afford that. Our recommended approach is that you start your business rapidly and cheaply, keeping costs and risk at a minimum. And once you start making money, then you can start affording pros to create better stuff for you. I believe that this approach results in more demand overall for designers and other professionals. I respectfully disagree. That would be no different than you telling Shane to stop making Thrive Architect so easy to use because one does not then need to hire a web designer to build their site. We each tend to be protective over our area but the world evolves, people evolve and the only constant is change. I find if interesting those who want to protect only their career or their skill set, because that normally is done at the expense of someone else. Instead of living in the scarcity mentality you could choose the abundance mentality. Of course, the choice is yours to make. I choose to live in abundance thinking… and welcome competitors. If my skillset gets automated or simplified then I will learn a new skill and move on – every evolving…. We now have robots that do a lot of the manual tasks in the world which should be embraced, not being feared… because this means that humans can then create more and innovate more. This is so much easier — and in the long run better — to DIY it! And, all the benefits mentioned in the video… no big graphics, easy to edit and replicate! Templates & Symbols make this even better since they can be re-used. Such a time-saver! Thrive just keeps on delivering, saving us time & money! I can’t think of any specific examples I’d like to see, but these “Build It!” with Architect videos are awesome! There are so many things you can do with Architect that i personally would never have thought of…like the book cover! Thanks for your comment, Karen! I prefer this approach as well, yes. You’re right that there’s a certain amount of extra work and overhead that always comes with hiring people to do design work and such for you. I wish there was a way to use thrive architect to create the actual e-books! Now that would be amazing and definitely make it super simple to create beautiful content for an e-book! Thanks for your comment! For the ebook content itself, here’s how I see it: if you want a really fancy looking PDF, then a publishing tool like InDesign is ideal. If you want something simple and nice that can be delivered online, then putting your content on a landing page or a nice WordPress page is a good approach. Using Thrive Architect to try and construct something that is then produced as a PDF is something I don’t see happening. It’s just a mis-match of tools, from a technical standpoint. Another great option is to deliver your free content in the form of an online course, as described here. That was fantastic! I built this same E-book cover while doing the Fit brand tutorial you did a couple of months back. This tutorial showed me a way to shave off about 45mins and save it for future use. Once again, excellent work. Yet another terrific video from Shane and the Thrive team. Yes, it is simple but that is what I am looking for. Can I export this to PDF? Great video. I’ve hired a designer in Fiverr and I got my ebook cover for $10. But after a while, I wanted to change the headline of my ebook but was stuck with a fix design. Now, is there a way of making the book a little more like the 3D versions? And how would you design the cover in a more compelling (but easy) fashion? Adding pictures or images, picking the right fonts and colors, etc. All of your videos are fantastic. Thank you. Thank you for your comment, Marisa! You could add a lot more stuff to a cover design like this but I like to keep things simple and minimal. The more stuff you try to add to a small object like this, the more complicated and time consuming it will get. But you’ll likely only get marginal returns on all that extra effort. Thank you for this great tutorial. I LOVE these tutorials! I love the simplicity, especially for mobile. These “Let’s Build It” are exactly what I love to learn from. You are an excellent teacher and your company is fantastic. When the Thrive Theme Blog is in my inbox… I read it, I click it.. yours is the one email that I never trash! Simple and very effective, huge timesaver. You could also configure it to display an audio file download and not just an e-book cover. Thank you. Shane, appreciated. A side question please. I’m just starting to write blog posts and trying to figure out how to shorten the time I take to write each blog post. How quickly can you write blog posts like the one above, especially a 1000-1500 word blog posts? What approach do you take to write them quickly? One thing I’m noticing is that I’m getting quicker as I become more familiar with writing about my topic. But, I’m still taking 1.5 days to write each post. So any suggestions you have would be great. Thanks for your comments Andrew! To answer question about writing blog posts, all I can say is that it takes time, practice and discipline to get faster at shipping high quality content. When I started out, I was slooow, but the experience of writing several posts for a blog like Thrive Themes — that priorities article quality over quantity — has steadily reduced the time it takes me to ship articles. Personally, I never write for any particular word count, but only to express or teach the points we’re trying to get across in the most concise and interesting ways possible. We do have a well honed content creation system here a Thrive Themes which has really helped me to deliver better posts faster. I write the first draft of my post as fast as possible — without ever letting my pen leave the paper if you will. If I need to add sources, images or screenshots to illustrate any points I’m making, I make notes in the first draft (using the search marker tk) so I can keep writing and address those issues in my second draft. I then complete the second draft to edit and clean up any issues I had in the first. At that point, I then throw my adolescent post into our content team meat grinder so it can be peer-reviewed by fresh eyeballs as soon as possible. To be honest, I now accept the fact that all writing is basically “meh” until you poke it with fresh perspectives so a peer-review step is priceless! I then make all the suggested team edits followed by building the final post in Thrive Architect. Once the article is looking pretty on the website, it gets a final look-over by the team while I complete the backend tasks like adding categories, tags, Yoast SEO info, etc. It takes time and discipline to bump your speed and quality of writing, but the hard work pays off if you keep at it. Good luck with your writing Andrew! How about putting this as an product image in woocommerce?